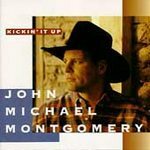 (NEW AND FACTORY SEALED) Artist: Montgomery, John Michael Release Date: 1994 Format: CD Record Label: Atlantic (USA) Genre: Country UPC: 075678255922 Sub-Genre: Mainstream Track listing 1. Be My Baby Tonight 2. Full-Time Love 3. I Swear 4. She Don't Need A Band To Dance 5. All In My Heart 6. Friday At Five 7. Rope The Moon 8. If You've Got Love 9. Oh How She Shines 10. Kick It Up Details Producer: Scott Hendricks Distributor: WEA Recording type: Studio Recording mode: Stereo SPAR Code: n/a Album notes Personnel: John Michael Montgomery (vocals); Steve Gibson, Billy Joe Walker, Jr. (acoustic guitar); Dan Huff (acoustic electric guitars); Brent Mason (electric guitar); Paul Franklin (pedal steel guitar); Stuart Duncan (fiddle); Reese Wynans (piano, Hammond B-3); John Barlow Jarvis (Hammond B-3); Bill Cuomo (synthesizer); Glenn Worf (bass); Lonnie Wilson (drums); John Wesley Ryles, Dennis Wilson, Harry Stinson, Mimi Nuyens, Bruce Sulfridge, John Kunz, Mike Janas (background vocals). Recorded at Woodland Recording Studios, Nashville, Tennessee. "I Swear" won the 1995 Grammy Award for Best Country Song. It was also nominated for Song Of The Year and Best Male Country Vocal Performance. What separates John Michael Montgomery from other Nashville hunks? For starters his dimples are deeper, his hats are darker, his shirts are cooler, his songs are better, his voice is more versatile, and he's not from Texas. He's a Kentuckian who cut his teeth in local bars and is now spending most of his time at the top of both the country and pop charts. The hit-laden KICKIN' IT UP held Billboard's #1 Pop Album position, due mostly to the killer ballad "I Swear," which later reached #1 for the pop group All-4-One. The devotional "I Swear" is a once-in-a-lifetime career-making song, and it attests to Montgomery's talent in selecting material. Montgomery is the current successor to George Jones, and the honky tonk in his world has a blistering country jukebox, beautiful women, fast-flowing beer, and a whole lotta dancing. He wears his influences proudly, especially in the Jones-influenced "She Don't Need A Band To Dance." The ease in which Montgomery flows from the gimmicky, slamming, country rocker "Be My Baby Tonight," to the emotional ballad "Rope The Moon," proves what an effective interpreter the young performer is. John Michael Montgomery has taken Nashville by storm and is certainly KICKIN' IT UP, separating himself from the pack...in a big cloud of barroom floor sawdust. Additional Information about Kickin' It Up Portions of this page Copyright 1948 - 2008 Muze Inc. All rights reserved.